Budyko, M.I. (1969). The effect of solar radiation variations on the climate of the Earth. Tellus, 21, 611-619. Sellers, W.D. (1969). A global climatic model based on the energy balance of the Earth-atmosphere system. Journal of Applied Meteorology, 8, 392-400. Fetterer, F., K. Knowles, W. Meier, and M. Savoie (2002, updated 2011). Sea Ice Index. National Snow and Ice Data Center, Boulder, Co (digital media). Global Snow Lab, based on the methods described in Robinson and Frei (2000). See also http://climate.rutgers .edu/snowcover. Armstrong, R.L., and M.J. Brodzik (2005). Northern Hemisphere EASE-Grid weekly snow cover and sea ice extent version 3. National Snow and Ice Data Center, Boulder, CO (digital media). Robinson, D.A., and A. Frei (2000). Seasonal variability of northern hemisphere snow extent using visible satellite data. Professional Geographer, 51, 307-314. UNEP/GRID-Arendal (2007). Mean snow-cover extent in the Northern Hemisphere 1966-2006. UNEP/GRID-Arendal Maps and Graphics Library. Available at: http://maps.grida .no/go/ graphic/mean-snow-cover-extent-in-the-northern -hemisphere-1966-2006. Permafrost area is from Zhang et al. (2008), and glacier and ice sheet extents in table 1.1 are updated from Lemke et al. (2007), with ice on the Antarctic Peninsula accounted as peripheral glacier cover, dynamically distinct from the Antarctic ice sheet. 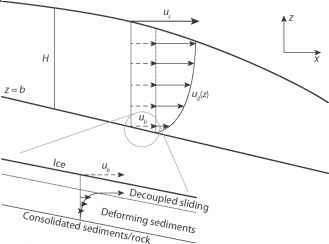 See chapter 6 for a full discussion of ice area and volume estimates in table 1.1. Brown, J., O.J. Ferrians, Jr., J.A. Heginbottom, and E.S. Mel-nikov (1998, revised February 2001). Circum-Arctic Map of Permafrost and Ground-Ice Conditions. National Snow and Ice Data Center/World Data Center for Glaciology, Boulder, CO (digital media). Lemke, P., J. Ren, R.B. Alley, I. Allison, J. Carrasco, G. Flato, Y. Fujii, G. Kaser, P. Mote, R.H. Thomas, and T. Zhang (2007). Observations: Changes in snow, ice and frozen ground. In: Climate Change 2007: The Physical Science Basis. Contribution of Working Group I to the Fourth Assessment Report of the Intergovernmental Panel on Climate Change (S. Solomon, D. Qin, M. Manning, Z. Chen, M. Marquis, K.B. Averyt, M. Tignor, and H.L. Miller, eds.). Cambridge University Press, Cambridge, UK, pp. 337-383. Zhang T., R.G. Barry, K. Knowles, J.A. Heginbottom, and J. Brown (2008). Statistics and characteristics of permafrost and ground ice distribution in the Northern Hemisphere. Polar Geography, 31 (1-2), 47-68.